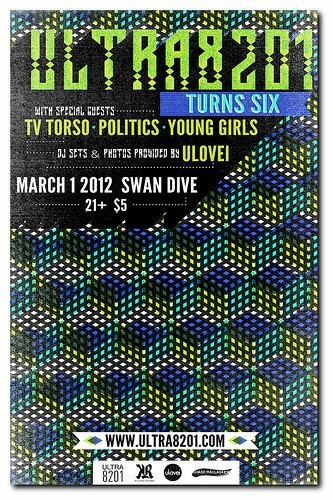 One, of the many, things I love about Austin is the collaborative atmosphere in the arts community. When I started this little blog a few years ago it was not met with resistance from the other Austin music bloggers, it was embraced. They posted links to my site on their site, they said hello at shows and they supported me morally and professionally. It is with this spirit that I jokingly refer to Richard from Ultra8201 as my blog-father. 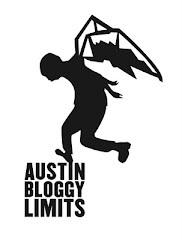 Ultra8201 was the first site to add Austin Bloggy Limits to their blogroll and Richard was the first person to introduce me to our fellow bloggers and tweeters and I will always appreciate that. Writing of any sort can feel like sending a message in a bottle, you've put your words out into the universe but you're never really sure if anyone has received your message. That is why writing a music blog, consistently, for six years is quite a milestone. Ultra8201 brings lots of great content to the masses on a regular basis and they also put on great events. They have supported some really fantastic Austin bands when they were just starting out and helped to get their names recognized around town. Tonight is a celebration of great writing, great events and great friends. All of us in the Austin blog community hope that you can make it out to Swan Dive this evening to enjoy some great music from local artists and to celebrate six years with Ultra8201. Also, you should dress to impress because Austin's greatest party photographer, ulovei will be spinning tunes and capturing you with his camera as well. See you there!